This Beef Cabbage Stew is hearty, comforting and makes a perfect meal with crusty bread. It is packed with lots of flavors to warm you up! Quite versatile too. Add in whatever vegetable you forget in the fridge. It is really easy to make and everything cooks in the same pot. Who would refuse a tasty, healthy and quick dinner like this Beef Cabbage Stew on a weekday? Unlike the original recipe, I didn’t add any bulgur in this stew. We love it both ways, so you can add bulgur, rice or quinoa if you want to make your stew even richer. The best thing about this recipe is that you cook everything in the same pot. Start with heating olive oil in a pot and cook chopped onion until transparent. Add in ground beef and a little water. Stir occasionally pressing gently on the ground beef so that there aren’t any blocks left. Cook until the ground beef first releases and then absorbs its juice. Season it with black pepper, cumin and chili powder. Add in roughly chopped cabbage, carrot, garlic and 1 tablespoon lemon juice. Cook it over medium high heat for about 5 minutes stirring occasionally. Pour 1 and cup hot water and cook until it boils. Bring it to the lowest heat and let it simmer for about 20 minutes. Serve it hot with some fresh herbs on the top. What To Serve With Cabbage Stew? We love serving it with some crust bread or with our favorite No Yeast Quick Dinner Rolls or Rice Pilaf with Orzo. In addition, a bowl of homemade yogurt or Yogurt and Cucumber Dip aka Turkish Cacik could accompany. Optionally, you can serve a simple Red Radish Salad too. If you are really in a hurry, you can just slice a red radish and squeeze lemon on it. As tasty as pickles. Yes, you can. This is one of those freezer-friendly recipes. The only thing you need is to thaw and reheat. Super time-saving for a busy weeknight meal! I don’t remember how many times I have heard that cabbage has so many benefits for health this year. Our favorite cabbage dish is stuffed cabbage rolls, but I can’t make it as often as I want because of my limited time. And I have discovered a great alternative cabbage dish to stuffed rolls: Beef Cabbage stew! It wasn’t a dish I had made before, it just came to my mind all of a sudden when I was trying to decide what vegetable to buy at bazaar one day. Cabbages on the stand looked so fresh and small enough for me to carry. I was tempted to buy a head, but I didn’t have time to make stuffed rolls. Then I thought a stew with cabbage and ground beef could be as tasty. There would be no stuffing and rolling, but the same taste with almost the same ingredients with our regular cabbage rolls. Glad I bought cabbage that day and made this stew because it has become one of our favorite dishes since then! When planning the recipe, I wasn’t sure if we would love it because cabbage stew is not one of those much liked dishes in Turkey. But I was determined to cook and see myself if it could become a hit or not. How could a dish with ground beef and cabbage become tasteless? To our surprise, it was superb! Plus, it is very easy and doesn’t require a lot of time to cook this cabbage stew, I’ve made it several times since then. Try it when cabbage is still in season! 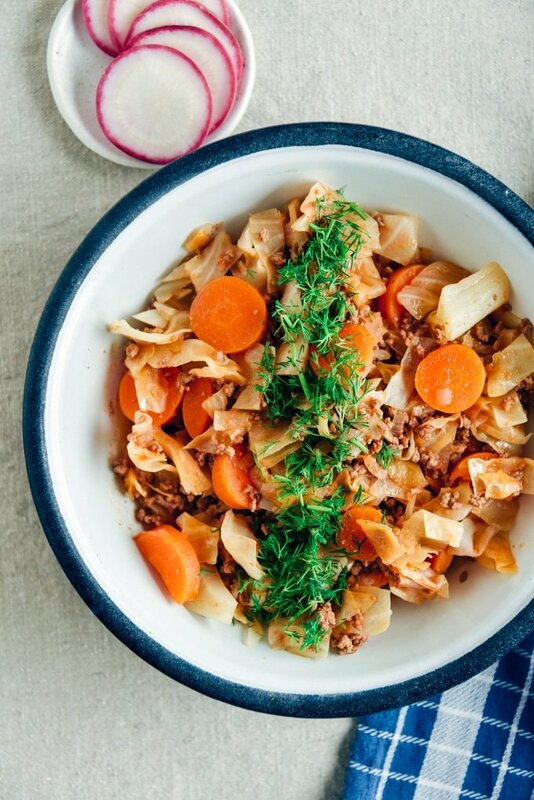 A comforting and tasty stew with cabbage and ground beef. Heat olive oil in a pot, add in onion and cook until transparent. Add in ground beef, tomato paste and 1/4 cup water. Stir occasionally pressing gently on the ground beef so that there aren’t any blocks left. Cook until the ground beef first releases and then absorbs its juice. Season it with salt, black pepper, cumin and chili powder. Add in roughly chopped cabbage, carrot, garlic and lemon juice. Cook it over medium high heat for about 5 minutes stirring occasionally. Pour 1 cup hot water and cook until it boils. Bring it to the lowest heat and let it simmer for about 20 minutes. This looks super delicious! Curious if there is a way to make this dish in the slow cooker? Could I brown the meat first and then throw in everything else and let is slow cook all day? Wondering if the cabbage would end up too soft? Hi Taylor! Never tried this recipe in the slow cooker, but I guess it would work fine. Yes, brown the beef first. Just slice the cabbage in thick pieces to prevent it from getting too soft. Cooking it for 4-5 hours would be enough. Hope these help. This is such a dreamy recipe. I can only imagine how yummy it is with a cup of cacik. And these photos.. They take my breath away and make me very hungry. Thanks my friend! You need to make it before spring comes in your area. And we are so happy to hear that you love the photos!